Founded in 2011, Grand Rapids based non-profit [Fashion Has Heart] aims to benefit wounded soldiers through the mediums of fashion, art and design. Bates, being the largest supplier of military footwear, was instantly on-board to partner with the [Fashion Has Heart] team and soldiers. Each year, five soldiers with a heroic story to tell are paired with designers from [FHH] and Bates footwear to create a custom pair of military boots that portray their story and sacrifice. Amazingly, some heroes even recounted wearing these boots at the time of their injury, which aided in making this process even more close to home for many of them. The final works of art are featured as a venue during the worldï¿½s largest open art competition, ArtPrize, taking place annually in Grand Rapids in September. 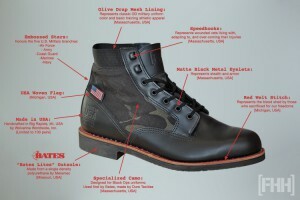 Most recently, wounded veterans worked with Bates to create a 100% made in the USA, limited edition boot that was inspired by both the combat boots and dress uniform shoes worn in service. Genuine leather welt construction ensures long-lasting quality on top of a lightweight Bates Lites outsole for anti-slip traction and comfort.